I've lined up some sweet swag for this auction. As you may know, Baby Patches momma has health issues and may have to close our favorite online store Nip and Bones, which just happens to be the only place in the US that sells Silvervine. If they closed, we'd all be going through withdrawal soon. I'm going to be auctioning off 5 items over the next 2 weeks, approximately one every other day. Lemme give you a list of what I have lined up: 2 copies of CK's Rockin' the #Nipclub CDs, a custom designed avatar from GLOGIRLY DESIGN, a package of 12 hand-painted Gratitude cat rocks and a pouch of nip from Tiny Pearl Cat, and a one of kind handmade quilt from my homey, MaggieTKat. I'm sure most of you are familiar with the gorgeous quilts that Maggie, Parker and their peeps make for charity. Here's the quilt they made for Okey's Promise and here's the one they're making for Amy and SebassCat. Every item is lovingly handmade and unique. Many thanks to the wonderful cats who are donating their time and talent to help keep Nip & Bones open. Support anipals by shopping anipal! 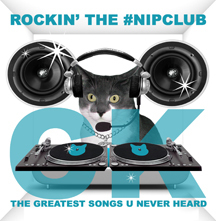 The first item is a CD of CK's Rockin' the #Nipclub (The Greatest Hits U Never Heard). I have a lot of fans when I become DJ CK every Thursday night at the #Nipclub and now they (and you) have a chance to own some of the music that I've been playing. Songs like the Birthday Song, Let's Have a Pawty, Let's Dance and plenty more. eighty minutes of rock, pop, and oldies. Who am I kidding, they're ALL oldies, just like TW! As if that isn't enough, this package also includes cover art, designed by Katie and her @Glogirly. She's made a couple of different color covers and you'll have your pick of pink, blue or green. Still not convinced that you should bid, how about if I toss in a bag of @TinyPearlCat's homegrown Nip? Believe me, Pearl's homegrown catnip is the best, most potent nip you'll ever sample. She sent me a bag in her Christmas card and the aroma filled our entire mailbox. You can see this Nip for yourselves here! You can't buy this cool CD or Pearl's nip in any store! The starting bid for this package containing the custom-made CD and homegrown nip from @TinyPearlCat will be $20. Leave your bid in a comment, along with the color you prefer. Bidding will be open until 11:59 EDT on July 5rd. I'm throwing in an extra day because of the holiday. Please bid whole dollar amounts. All money raised will go directly to Baby Patches. TW will not even let me sniff it! THIS AUCTION IS NOW CLOSED! The winner is @Cheriswan. This looks like such a great auction. We hope you get tons of bids. 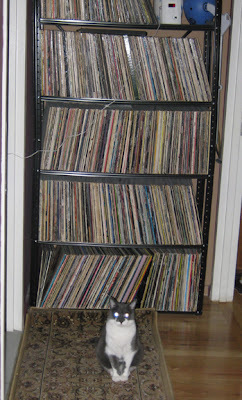 Those look like some great CD's. Take care. Good luck with the auction. Wishing you a happy Tuesday! You are such a good pal to help so much!!! Dash and I will be putting in a bid, we are going to do a blog post and tweet about this too! Good luck with the auction. We've already donated and bought something from Nip and Bones. That's all we can do right now, but thank you for helping out. CK, this is a pretty cool thing you're doing for Baby Patches and her mom. We're gonna go for that quilt. It's awesome!! *holds up a paw* I'd like to bid $25! I'd like to bid $35.00. I hope we raise lots of monies for BP & her mama! WooHoo!!! This is going to be a FUN auction!!! Thanx for the shameless plug, CK!